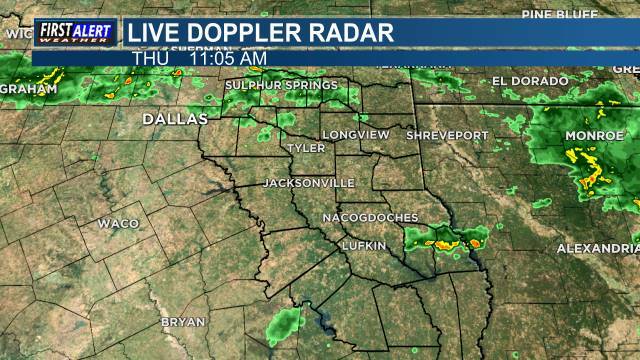 EAST TEXAS (KLTV/KTRE) - Another sunny day ahead for East Texas! Temperatures will rise into the middle 60s with winds becoming gusty this afternoon. Overnight lows will sink to the low 50s. Tomorrow some clouds will return but we will still see some sunshine with temperatures warming into the low 70s. Winds will be gusty throughout the day. Friday we will remain warm with temperatures in the 70s but more clouds are expected to come around. For the weekend temperatures will start to cool off as a cold front comes through. Sunday we could see scattered showers in the morning with temperatures cooling into the upper 50s. A cooling trend continues into the start of the next work week with temperatures only getting into the middle 40s. There are low rain chances on Monday and Tuesday as well.